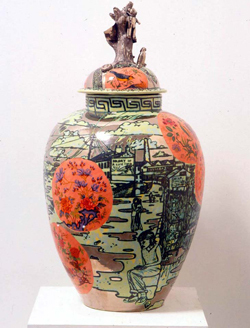 Grayson Perry is a ceramic artist who makes detailed extended doodles. Perry uses a very tradition material in a traditional way to make his ceramics. However, the tradition stops once it gets to the subject matter. The subject matter is where his often weird and wacky imagination and want to shock comes into play. Utilising pottery as his medium he uses text and imagery to detail his social concerns inviting us to join him on his often-one-man crusade. 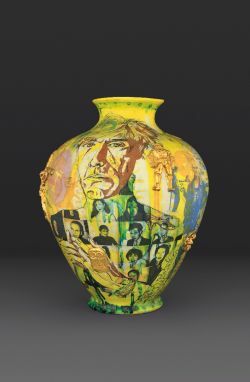 The imagery on the ceramics often includes his thoughts on his formative years and experiences and to relate the story of his alter-ego Claire. He often dresses as his women Claire disconcerting those meeting him for the first time. The text and imagery are often cruel, caustic and complex which he combines in an incongruous juxtaposition making viewers think twice about what is scratched, embossed or glazed on his work. He uses nostalgic sentiment alongside sarcastic comments wrong footing the viewer into what his actual meaning is in the piece. Most of his work invites viewers to proceed with viewing, decrypting and understanding his work; which they often tentatively as they may seem wary of what they will discover. Saatchi Gallery. (2018). Grayson Perry – Artist’s Profile – The Saatchi Gallery. [online] Saatchigallery.com. Available at: https://www.saatchigallery.com/artists/grayson_perry.htm [Accessed 20 May 2018].